This Prosciutto and Arugula Deviled Eggs recipe is a lovely appetizer for any celebration, featuring salty prosciutto and peppery arugula in the creamy deviled egg filling. When my friend came to visit this weekend, I don’t think she was expecting me to be recipe testing. But it was a rainy, dreary Sunday and that meant that heading to the zoo, the park or anywhere else outdoors was out. So, I whipped out my handy-dandy notebook and decided to test a few recipes. This friend has known me since before I could really cook. In college, I tried. I really did. But it felt like recipes were written in some version of English I had never seen before. My friend was there when I eschewed cans of Spaghetti-O’s to make a fancy-pants pasta lunch that looked strangely like … Spaghetti-O’s (and she appropriately laughed at the time I spent creating from scratch what I already had). She braved my many vegetarian soups … which all tasted strangely similar. And then, when my cooking ambitions were replaced by frequent ventures for takeout, she and I supported each other as we dropped all the pounds. These are Will’s and my favorite of the bunch. 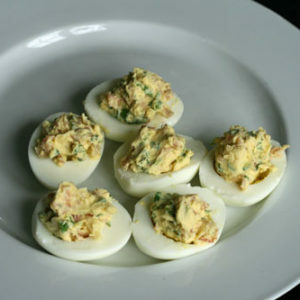 I love the nuanced combination of flavors in these Prosciutto and Arugula Deviled Eggs. They’re a little salty and peppery … but not too much of any flavor. It’s subtle, but still a step up from the ordinary. These would be a fantastic addition to any Easter spread. Cut the eggs in half and remove the yolks (drop them into a medium-sized bowl). Arrange the intact egg white halves on a plate and set aside. To the egg yolks, add the prosciutto, mayonnaise, lemon juice, arugula, black pepper and dry mustard. Mash and stir with a fork until fully combined and somewhat smooth. Divide the egg yolk mixture evenly between the egg white halves mounding it as necessary. Cover and chill until ready to serve. 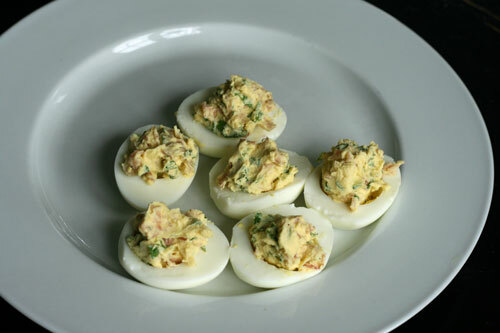 I’m always looking for non-boring ways to use my Easter deviled eggs – this one looks great! .-= Donna´s last blog ..Meatless Monday: A New Fresh Idea for A Meatless Springtime Feast – Asparagus “Noodles” =-. I LOVE proscuito. LOVE it. This will will definetly be part of Easter dinner. Thanks! .-= Kelly Banaski Sons´s last blog .. =-.